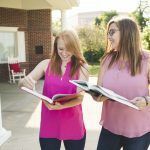 Alpha Sigma Alpha encourages members to connect with Alpha Sigma Alpha members in similar career fields or in similar regions by joining the official Alpha Sigma Alpha Sorority LinkedIn group. In the ten-video series in the link above, nationally recognized job search expert Brad Karsh of Job Bound provides tangible advice on students’ greatest job search concerns. Each three-minute video is packed with specific tips delivered in an easy to digest and engaging way. By clicking on the link to the videos, you will receive valuable job search advice. The Alpha Sigma Alpha Foundation exists to support the educational, leadership and philanthropic purposes of Alpha Sigma Alpha Sorority through charitable giving. Inspired by its mission, the Foundation offers Career Enhancement Grants to deserving members wishing to pursue a career goal, continuing education opportunity or retraining in their desired field. Applications are accepted year round and funds are awarded as available. And other skills that are marketable in the workforce.